Why should your windows have all the fun? Give your interior doors the Shutterly Fabulous treatment and transform them into a real style statement. Why have shutters on doors? 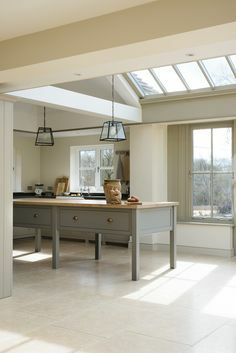 Whilst standard window areas are the most common source of light in the home, many of us now enjoy the light and sense of space offered by glass doors like french windows and sliding patio doors. With this in mind, wooden shutters offer lighting and temperature control, as well as an extra level of privacy that you wouldn’t ordinarily enjoy from these types of doors. With a range of folding and sliding functions available, our shutters for doors offer seamless transitioning in a wide variety of interior door spaces. As well as being made from the best hardwood to our inimitable standards, our door shutters can fit the most precise specifications; even awkward spaces like doorway arches. Louvred full-height shutters are a popular choice for french doors, thanks to their moveable slats that allow for complete light and temperature control. Their full height coverage means you can leave your french doors open with the shutters pulled across to benefit from the cool air, extra shade, and added level of control – great if you have young children or pets that you’d rather not have running in and out. 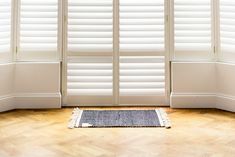 Part-louvred, part-panel designs are another favoured choice for shutters for french doors, offering light control whilst solid wood panelling breaks up the full shuttered effect of the louvres. Wood panels are also easier to clean in busy home spaces such as the kitchen (where most french doors will be found). The key factor to consider with shutters for patio doors is the transitioning. We offer a range of movements for patio door shutters including everything from bifold to bypass tracked shutter designs. Bifold shutters’ concertina effect means panels can be pushed to one side of your patio door with each neatly stacked in front of the other. This, in a louvred or solid wood style, gives you the option of a completely open door space or the freedom for extra privacy, light and temperature control. Bypass shutters also work on a tracking system, but instead slide one panel behind the other. 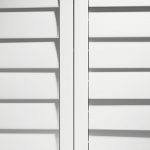 Bypass shutters are ideal for those who have a single patio door in a large window area or want some coverage at all times. Hit the book appointment button below and fill out the simple form. A member of the team will then be in touch to confirm the date and time of your free appointment with one of our shutter specialists. 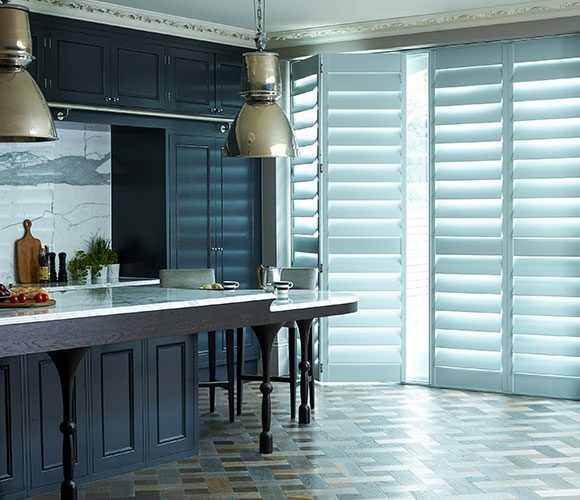 A shutter specialist will visit you free of charge to talk you through your options, measure up, answer your questions and finalise your quote. 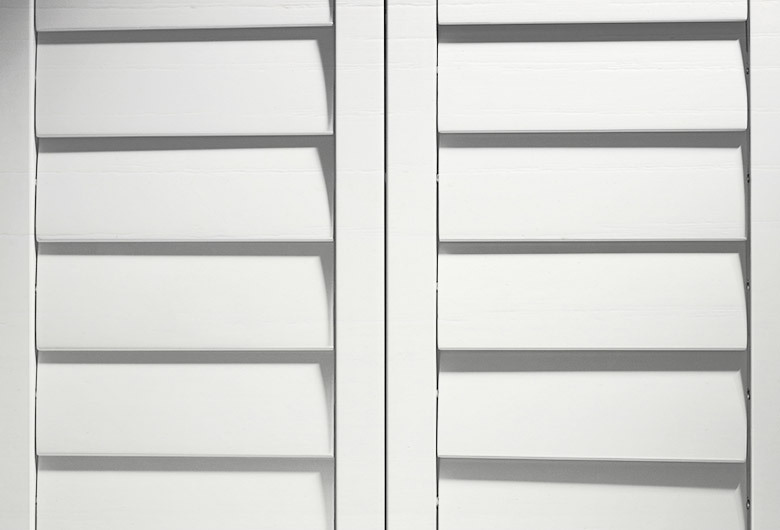 We’ll arrange a date and time for your shutters to be fitted by a professional carpenter who’ll leave you with a care kit to keep them in prime condition. When it comes to choosing the right type of wood for your door shutters, there a number of options to ensure the space is styled perfectly for your home. Affordable Basswood is a popular choice if you’re covering a large area with shutters. Basswood is not only of good quality, ensuring sturdiness, but as the name suggests, it’s also friendly on the bank balance. Our FSC-certified Poplar Wood Shutters are a premium choice for those looking for ultimate durability, together with an elegant and seamless finish. 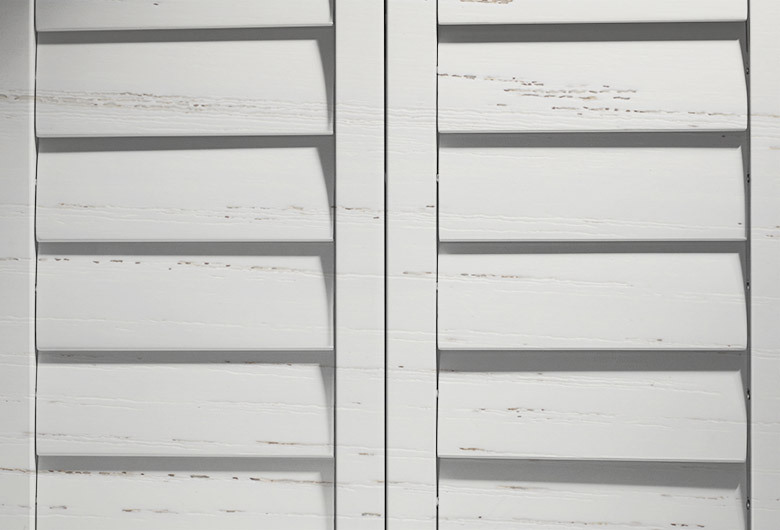 If you’re in search of a more natural, rustic look for your door shutters, then Elm Wood may well be the material for you. With its signature grooves and knots, these shutters add character to any door space. The range of colours available for your wooden door shutters very much depends on the material you decide to go with. 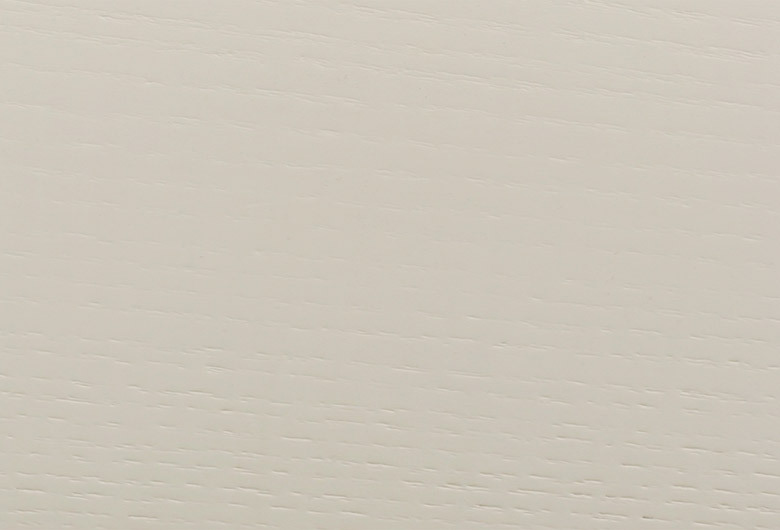 Whilst each of our wood ranges offer neutral tones like bright white, silk white and ivory, you’ll find soft grey, green and creamy shades across our Poplar and Elm ranges. Our Elm range also includes wood stains as opposed to paints for a true wooden window shutter effect. We also offer a custom colour matching option in our Poplar and Elm ranges – this comes at an additional 10% and is a great choice if you’d like to match paints that already feature in your home. Explore the colour options available to you by clicking the colour swatches below. What’s the difference between affordable and cheap? In a word, quality. 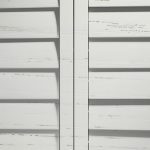 Bulky, heavy MDF shutters are cheap, but Affordable Basswood offers style and reassurance as well as great value. 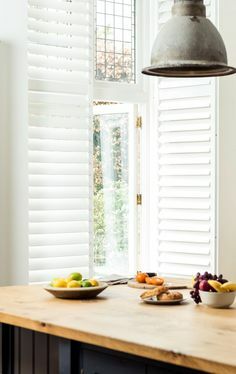 Basswood’s availability means we can buy the timber very reasonably and use it to make affordable plantation shutters for standard-shaped windows. Fast-growing Yellow Poplar gives strong yet lightweight FSC® certified timber ideal for large interior doorways and windows. In our experience, no shutter timber is stronger or more durable. But that’s not to say Poplar is heavy-duty. 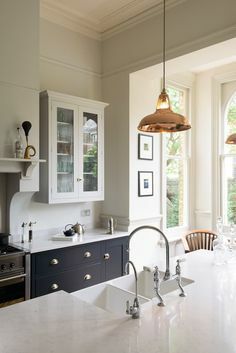 It’s a subtle, elegant wood with an even grain that takes both paint and stain finishes exquisitely. Best across large spaces, this range can custom-fit practically any shape. No wonder Classic Poplar is our most popular shutter. 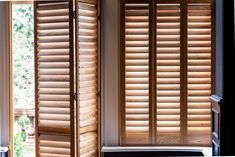 Choose the deep, sweeping grain of Elm and treat your windows to the ultimate in natural-wood shutter elegance. 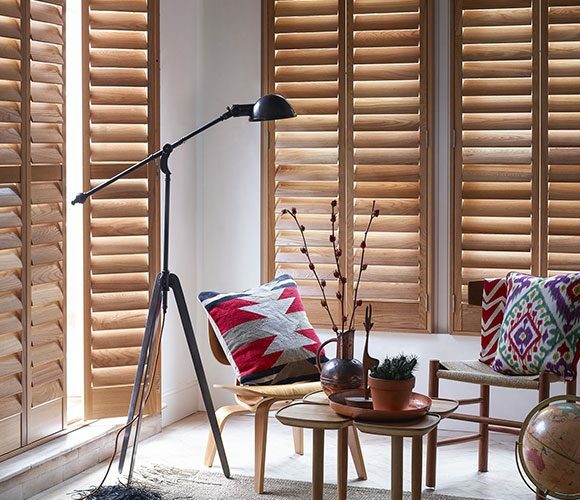 Our Premium Elm shutters are made from a luxurious timber with a natural wood effect that is best accentuated by a rich stained finish; we offer a range of refined tones. These shutters with their diverse deep grains give you a rustic, yet sophisticated finish, that will turn any window or door into the standout feature of your home (and attract plenty of envious glances from the street). Easy to clean and impervious to moisture, these shutters are the great-looking hardwearing choice for your wet room or bathroom windows that come into direct contact with water. finished shutters. I was even given spare louvrers in case of breakages which was a nice touch. I will use Shutterly again. was a nice touch. I will use Shutterly again. 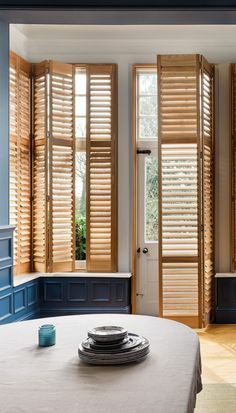 Shutters aren’t just for windows. Take a look at our gallery for some inspiration on how you can stylishly incorporate door shutters into your home.